In honour of the hosts of the 21st FIFA World Cup we would like to pay homage to a Russian product that has changed the lives of many, especially Iranians! When you talk about the tea culture in Iran and it is impossible to talk about it without mentioning the Samovar/Tea maker (self boiler). This handy instrument enabled civilizations to have warm drinking water throughout the day at a time when electricity was not yet in use. Samovar-like pottery was found in Shaki, Azerbaijan, estimated to be at least 3,600 years old. While it differed from modern samovars in many respects, it contained the distinguishing functional feature of an inner cylindrical tube that increased the area available for heating the water. Unlike modern samovars, the tube was not closed from below, and so the device relied on an external fire (i.e. by placing it above the flame) instead of carrying its fuel and fire internally. The first historically recorded samovar-makers in Russia were the Lisitsyn brothers, Ivan Fyodorovich and Nazar Fyodorovich. From their childhood they were engaged in metalworking at the brass factory of their father, Fyodor Ivanovich Lisitsyn. In 1778 they made a samovar, and the same year Nazar Lisitsyn registered the first samovar-making factory in Russia. They may not have been the inventors of the samovar, but they were the first documented samovar-makers, and their various and beautiful samovar designs became very influential throughout the later history of samovar-making.These and other early producers lived in Tula, a city known for its metalworkers and arms-makers. Since the 18th century Tula has been also the main center of Russian samovar production, with tul'sky samovar being the brand mark of the city. A Russian saying equivalent to "carrying coal to Newcastle" is "to travel to Tula with one's own samovar". By the 19th century samovars were already a common feature of Russian tea culture. They were produced in large numbers and exported to Central Asia and other regions. The samovar was an important attribute of a Russian household and particularly well-suited to tea-drinking in a communal setting over a protracted time period. The Russian expression "to have a sit by the samovar" means to have a leisurely talk while drinking tea from a samovar. 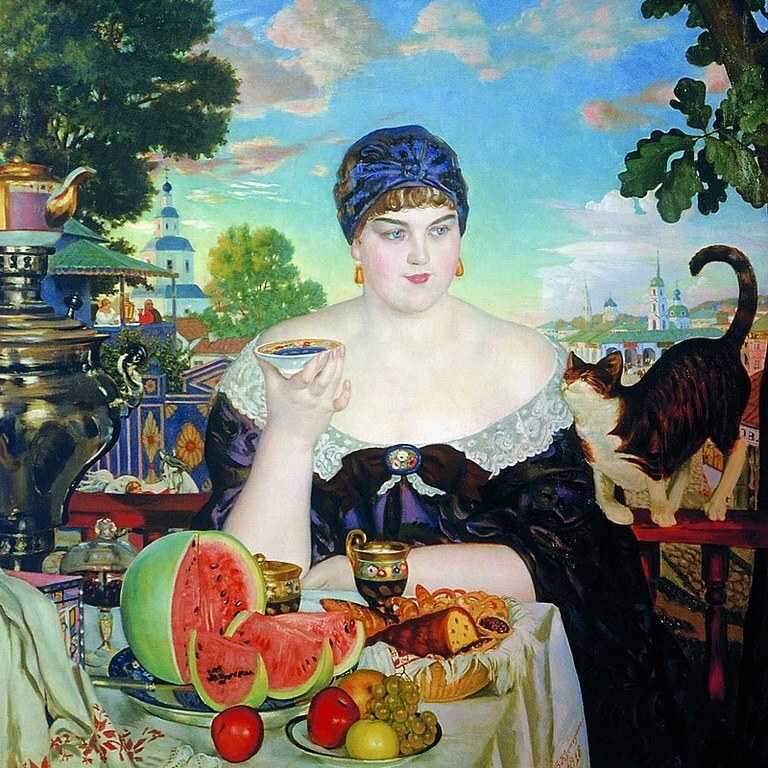 In everyday use samovars were an economical permanent source of hot water in older times. Various slow-burning items could be used for fuel, such as charcoal or dry pine cones. A traditional samovar, nowadays, consists of a large metal container with a tap near the bottom and a metal pipe running vertically through the middle. The pipe is filled with solid fuel which is ignited to heat the water in the surrounding container. A small (6 to 8 inch) smoke-stack is put on the top to ensure draft. After the water boils and the fire is extinguished, the smoke-stack can be removed and a teapot placed on top to be heated by the rising hot air. The teapot is used to brew a strong concentrate of tea known as заварка (zavarka). The tea is served by diluting this concentrate with кипяток (kipyatok) (boiled water) from the main container, usually at a water-to-tea ratio of 10-to-1, although tastes vary. 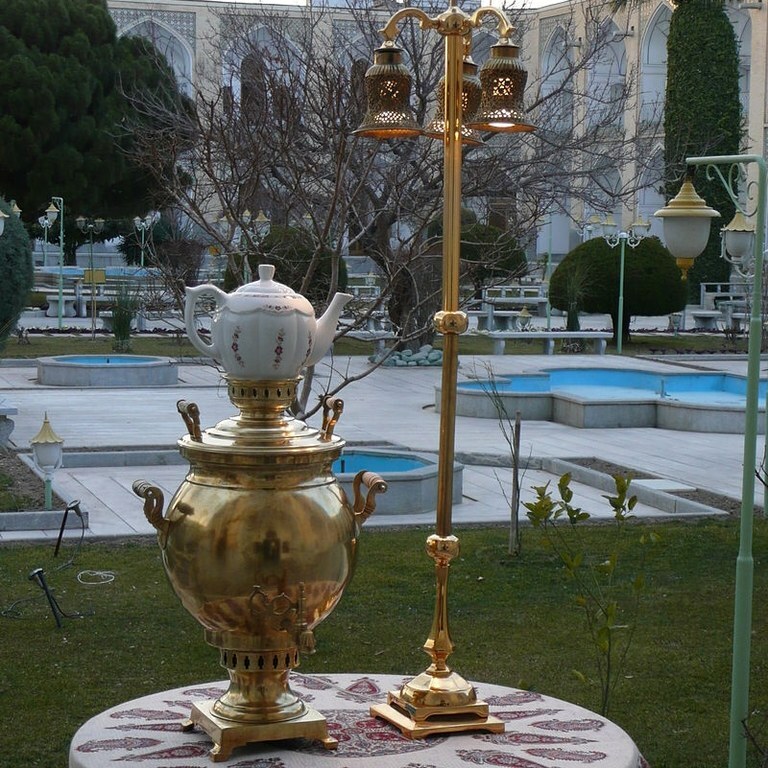 In Iran, samovars have been used for at least two centuries (roughly since the era of close political and ethnic contact between Russia and Iran started and it was introduced into Iran), and electrical, oil-burning or natural gas-consuming samovars are still common. Samovar is pronounced samăvar in Persian. 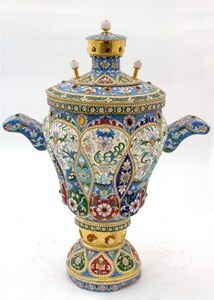 Iranian craftsmen used Persian art motifs in their samovar production. The Iranian city of Borujerd has been the main centre of samovar production and a few workshops still produce hand-made samovars. Borujerd's samovars are often made with German silver, in keeping with the famous Varsho-Sazi artistic style. 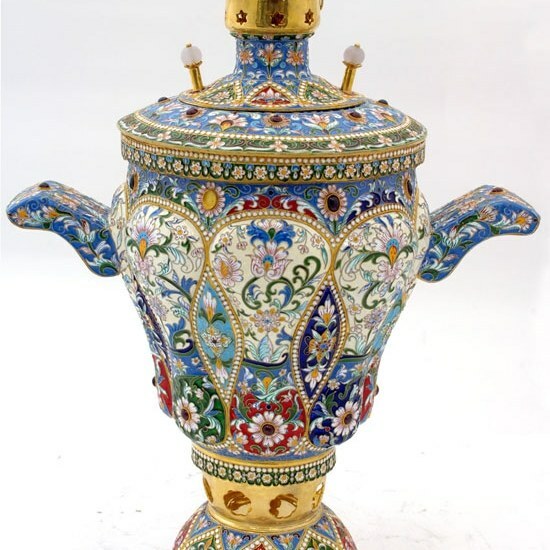 The art samovars of Borujerd are often displayed in Iranian and Western museums as illustrations of Iranian art and handicraft. 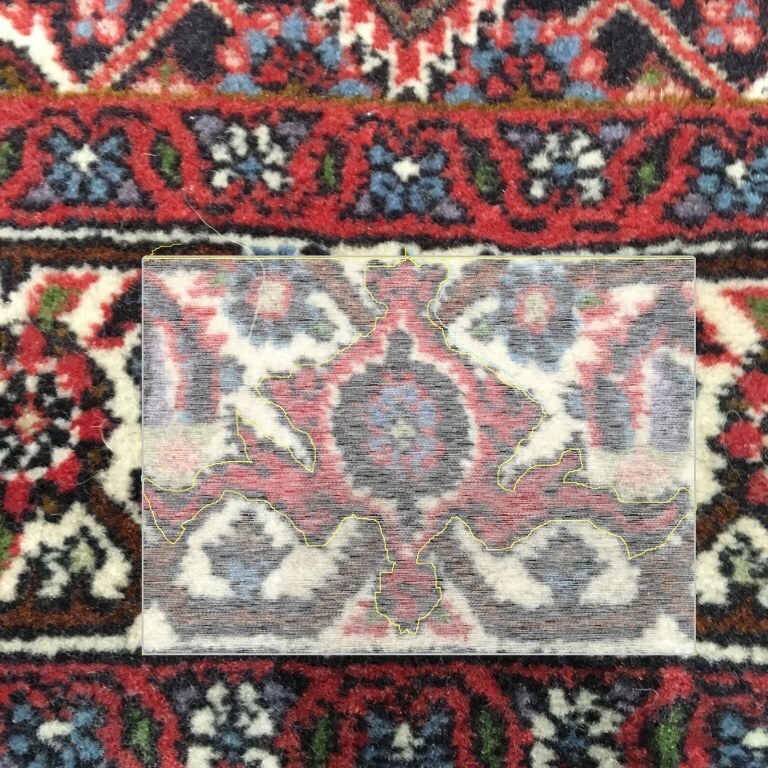 So important is the samovar in Iranian culture that its' design is even used in Persian carpet designs, like in the border of this Gholtogh rug.